Submitted by patrik on Thu, 2005-12-29 10:19.
just before a new year i have now released new version. Actually it should be a bugfix but because of new "Comments" functionality i made a new release. You can now post comments on pictures, this functionality is defalut disabled. You must enable it in new section in Setup (Comments and Votings). You can add new comment, with optional name and email. All help texts are in english, but this will be changed in new bugfix so you can easily edit all texts in application. As there is no possibility to delete comments or view all comments, this is not really recomeded to use it. All this comes in few days. Submitted by patrik on Sun, 2005-12-18 20:13.
today i released new version of phpAlbum. Version number 0.3.0.
with admin section now you can create new directories, upload photos and deleting them from phpAlbum. This is functional also with safe_mode=on because of using FTP for doing this job. If you install phpAlbum with wisard, the FTP parameters are automatically in main setup aviable. Otherwiese you must set this two parameter yourself. Submitted by patrik on Sun, 2005-12-11 19:33. First look at this clear and nice integration of phpAlbum on Badener Zeitung site. Submitted by patrik on Sun, 2005-12-04 22:40. Do you have the same problem as i had? As i had before i knew ImageMagick. Always if i wanted to upload photos i had to reisze them each, one by one. I made it in Gimp, may be you are using photo editor like Photoshop or something else. This was very slow and boring. That's why, i would like to introduce you ImageMagick. This is very useful package of programms. You can use it for creating, converting manipulating of pictures. Submitted by patrik on Sun, 2005-12-04 11:54. Today i released new version of phpAlbum. new installation should be even easier as befor. More error messages are implemented to help the user by the installation. few chache options are now implemented, now you can switch if you want cache thumbnails and resized photos. Until now there were only thumbnails cached. As i realised that many people upload full size photos, and resizing of them is quite slow. I thought for those people is this interesting feature. Submitted by patrik on Tue, 2005-11-29 09:51. This document handles about installation, setting up and using of phpAlbum. It always describes actual released version. In the next versions i try to make a link to this document in setup page of phpAlbum. There are two possibilities how to install phpAlbum. For automatic and very easy installation go to INSTALL section. There you can install phpAlbum on your ftp-server just in few seconds. This is almost the best way for installing phpAlbum. Especially for people not comming from programmers or some other computer freak community. If you want to install phpAlbum manually then the following description should help you. First you have to DOWNLOAD actual version of phpAlbum. It is recomended to have always the newest update, as this is an early stage of developing this tool. Submitted by patrik on Mon, 2005-11-28 14:09. Here you can post bugs, if you have some. Please always describe the version of phpAlbum, version of PHP and type of server you are using. The best way is also to give some link to the page where we can see the bug. Submitted by patrik on Sun, 2005-11-27 16:59.
today i have released new version of phpAlbum. There are few bug fixies, and added new features. short and long description of Photos. Under thumbnails is only short one displayed. Submitted by patrik on Wed, 2005-11-23 09:02. Yesterday (22.11.2005) i have released new version of phpAlbum. The only new functionality (besides some eliminated bugs) is the size settings of thumbnails and photos. As this is not really self explaining (shame on me! ), here you have short description of what you can do. Submitted by patrik on Fri, 2005-10-28 10:44. Why did i started to programm this PHP Photo Album. First, i was always searching for some easy to use and install PHP Album. As i am programmer i have never found something what i really liked. I needed something where i only have to upload my new photos and that's it. 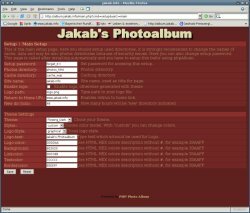 No thumbnails regenerating, no static page Photo album generator, just create new directory and upload my photos with FTP or SFTP. I needed some script which does not need any database, it should use file system, PHP and nothing else. Submitted by patrik on Fri, 2005-10-28 10:26. Installation of phpAlbum is now even easier as before. Just go to the INSTALL section and install it out of this site on your ftp-server. 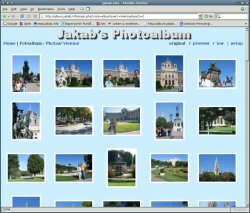 It is very easy and all you have to do after this is upload your photos with FTP. All directories are created autmatically and there will be alsou photo_xyxyx subdirectory where you can upload your images. If you want manually install phpAlbum then the following description of it can surely help you. Untar downloaded file and upload it to your webspace. Best way is to have an extra directory for this i.e. phpAlbum. Submitted by patrik on Sun, 2005-10-09 18:16. Welcom on phpAlbum internet site. Today we have released the first version of phpAlbum. 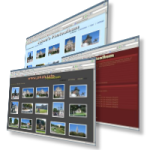 Our intention is to make an easy to install and run php-Script for showing your photos to your friends. exactly what you was searching for, as i did. Note that this is not even alpha release, in next versions will come some more comfort for configuration and setting up this application.